Whether you have a lovely kitchen garden or a beautiful lawn decorated with colorful plants, an “intruder” may show up to harm your house’s natural beauty. Of course, you will never like to see your gardening efforts going in vain just because a stray animal or your neighbor’s child decided to have a short stay in your property. Hoont Motion Activated Sprinkle is designed to resolve this problem safely. While you may have a secure fence and some other protective measures, none of them can be as useful as this sprinkler. 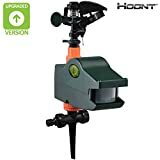 Hoont Motion Activated Sprinkler uses a motion sensor to detect the presence of an intruder on your property. As soon as an animal or a person enters its spray coverage area, it shoots water on that body for 5 seconds. This function is designed to startle any unwelcome guest in your property by minimum water consumption. Whenever its motion sensor detects a movement, it activates automatically. • You can easily adjust the spray coverage area to meet your requirements. • Its motion sensor can detect movement in the range of 30 ft.
• The sprinkler may activate even when you, your children or some guests enter in the spray coverage area if you have set it to the highest sensitivity level. Get rid of all those messy traps, chemicals, and pesticides to keep animals away from your garden. Instead, purchase Hoont Motion Activated Sprinkler today for best and ethical protection!it is what you need. A creative solution. Much humane and better than the zapping collar or something similar. Plus you get to water the lawn at the same time. Only one thing of concern is the battery lifetime of the sprinkler. Does it have an indicator for low battery?. I’m hoping it doesn’t take much current when the sprinkler is inactive. What I do is I put a reminder on my calendar to replace the batteries after a year. The batteries do last an very long time. But I like to keep the system up and running without any surprises. This solves the problem and I have never had an issue with my batteries running out.